In the event that a tooth cannot be saved by performing endodontic procedures, dental implants are a great option in restoring a tooth that might not otherwise be restorable. 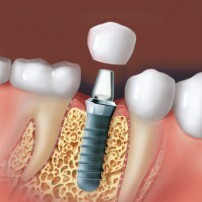 A dental implant is a “root” device, usually made of titanium, used in dentistry to support restorations that resemble a tooth or group of teeth to replace missing teeth. Westside Endodontics uses internationally recognized implants from Niobel BioCare and Straumann should the need arise.